There Is A Time To Be Born … Lillie Joyce Brown was born on July 3, 1950 in Tattnall County, GA to Daniel and Mellie Ruth Brown. She was proceeded in death by her Paternal Grandparents Henry and Annie Brown and Maternal Grandparents Hershel and Avis Braggs. 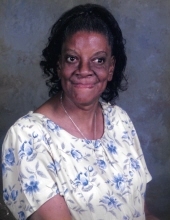 There Is A Time To Die ….. Lillie was called home to be with the Lord on Monday, March 25, 2019. Surrounded by her family at Tattnall Healthcare. There Is A Time To Live …… For many years Lille attended Gracewood in Augusta, GA before relocating to the Tattnall-Evans Service Center in Manassas, GA, later becoming a resident of Glenvue Nursing and Rehabilitation Center, Glennville, Georgia, then later a resident of the Tattnall Healthcare, Reidsville, Georgia. There Is A Time To Love ……. The legacy and love of her life is filled with wonderful memories, her parents Daniel and Mellie Ruth Brown, sistersRebecca Williams, Priscilla Brown, Pamela Brown and Tonja Brown of Glennville, GA, Diane Knight of Savannah, GA; brothers-Hercules Eason( Shirley) of Sanford, FL, Earl Brown of Collins, GA, Terry Brown(Lucille) of Savannah, GA, Erick Brown(Mae) and Patrick Brown, Glennville, GA. Aunts-Betty Davis(James) of Statesboro, GA and Eva Jordan(Michael) of Glennville, GA. A host of nieces, nephews, cousins and friends. To send flowers or a remembrance gift to the family of Lillie Joyce Brown, please visit our Tribute Store. "Email Address" would like to share the life celebration of Lillie Joyce Brown. Click on the "link" to go to share a favorite memory or leave a condolence message for the family.